This is an introductory post to the game The Westport Independent that is currently being developed with the use of luxe. The Westport Independent is a censorship simulator about the last weeks of an independent newspaper which is to be dismantled according to a new government bill. You play an editor in charge of choosing what will be printed in the paper, making sure that the content is nice and proper according to the government guidelines. With rebellions against the government rising slowly amongst the public, whose thruth will you print? The Westport Independent was originally an entry for the Ludum Dare 29 Jam where people gave us a lot of great reviews and we were given a good score. The original game jam version was created in 72 hours in Unity. A couple of game journalists also wrote pieces about the game and we were even given a full page in a swedish game magazine called Level. All of this made us change focus from the game we were working on at the time and we decided that this was the right game to focus on.The Ludum Dare 29 version of the game can be played over at our website http://www.doublezeroonezero.com. 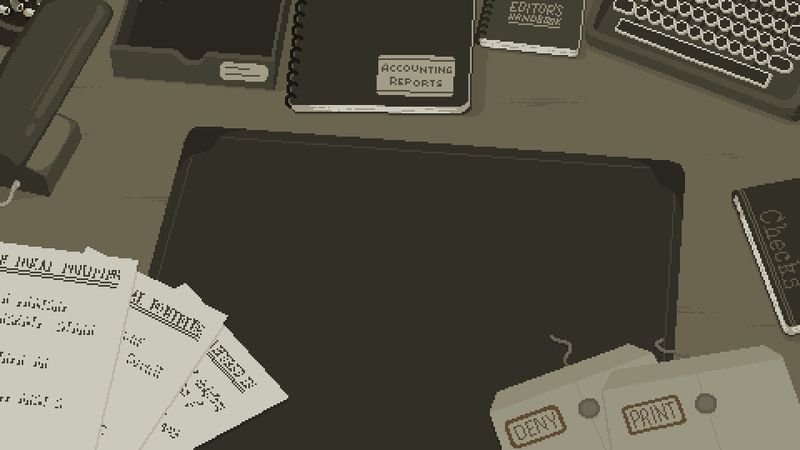 The game was originally inspired by Papers, Please, which most people will notice by just taking a first glance at the game. But the game plays very differently, the similarities between the games aren't much more than that the main way of interacting with the game is by dragging and dropping objects and the graphical style of the game. 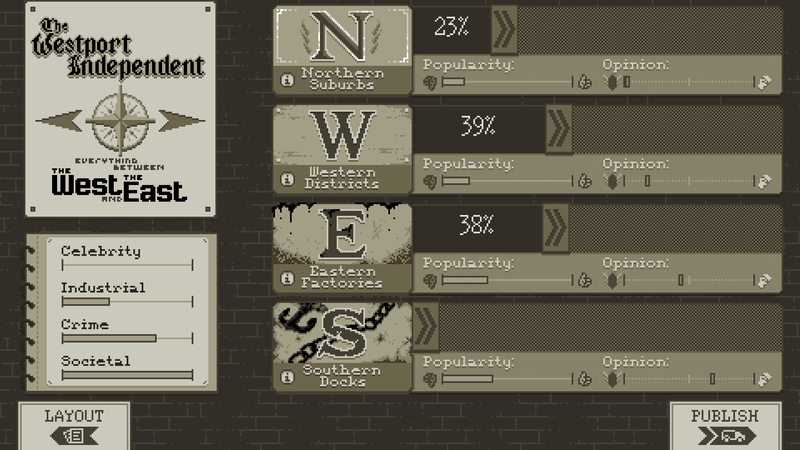 This is a screenshot of the Ludum Dare 29 version of The Westport Independent. Since then we have greatly expanded the game and are still in the process of further expanding and changing the things we allready have. Everything that was in the game jam version has been changed in one way or another. The only thing recognizable in the new version of the game is the way you censor articles, other than that everything is new. Even the graphics have been completely overhauled. This post will not explore the separate mechanics of the game any deeper, this will be done in later posts as there is a lot that can be written about each individual mechanic in the game. Below are two screenshots from the new version of the game and a gif showing off the coffee break which happens inbetween weeks, where your journalists discuss events that have happened and articles that have been posted. We will be showcasing The Westport Independent at Gamex/Comicon in Stockholm at the end of this month. We will be there with our own booth for the duration of the event. If you want to try the game or simply want to have a chat then look for our insanely big "The Westport Independent" rollup. Currently developing The Westport Independent. Programmer at Double Zero One Zero.